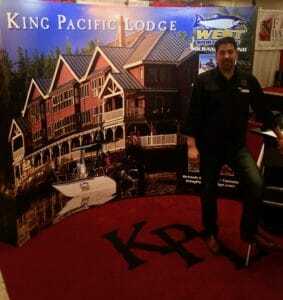 During the winter, King Pacific Lodge exhibits at several sport shows. Its an excellent opportunity to meet new potential guests and to visit with the many regular and repeat guests from past seasons. We’d like to take this opportunity to thank all who stopped by our booth in Sacramento CA and Puallup WA over the last two weeks! Over the fall and winter, we are pleased to be speaking with so many of the guests who are planning for the following season. There is much excitement about getting back out on the water and the big fish either caught or got away. Stories abound and are often shared with us who visit with our booth. We’ll be visiting the Edmonton area next and the local show runs at this location from March 15th to 18th. If you’re interested in fishing and would like some additional information please stop by or call us in advance. As always at this time of year we are busy planning for the season, communicating with guests and maintaining the lodge and fishing equipment. Should you still be looking for an incredible trip in 2018 and would like to discuss available dates please contact us anytime!